And that means, it's time to get some deep fried deliciousness. Thank goodness for Hearty Vegan Meals for Monster Appetites because that book is full of deep fried goodness. But nothing says county fair like funnel cake, so here is one straight from the book with a simple and fun recipe for some home made and VEGAN funnel cake! 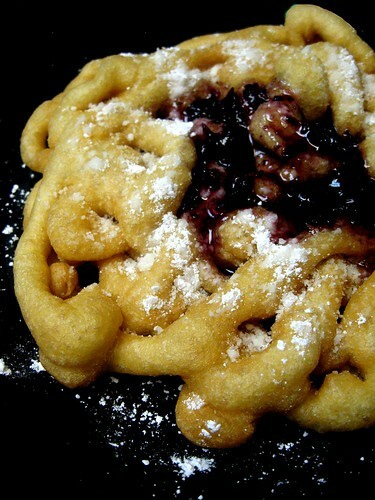 Home made funnel cake topped with jam and powdered sugar. These are easier than you might think to whip up in less than 20 minutes! Unless you have mad skills with a real funnel, I suggest you use a plastic bag, and snipping the corner off. A deep fat fryer works well here, but if you don’t have one, a pot filled with about 3 inches (7.5 cm) of oil will do the trick nicely. Preheat oil to 350°F (180°C). While oil is heating whisk together remaining ingredients until smooth in a medium mixing bowl. It should be the consistency of a thin pancake batter. Transfer batter to a resealable plastic bag. Snip a corner of the plastic bag and quickly swirl about 1/4 of the batter into the oil. Allow to fry for about 1 to 2 minutes then carefully flip using a slotted spoon. Continue to fry another 1 to 2 minutes until golden and crispy. Carefully transfer to a plate lined with paper towels to absorb excess oil. While stil warm, sprinkle with powdered sugar and jam, and serve. Hearty Vegan Meals for Monster Appetites, French Toast, and a GIVEAWAY! 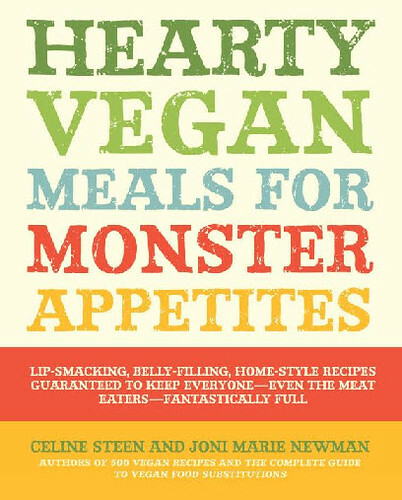 Hearty Vegan Meals for Monster Appetites...It's out! Yeah, I know...already? I could hardly believe it myself! 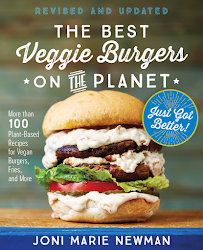 But it's true, and this hefty tome full of lip smacking, belly filling, home-style recipes, guaranteed to keep everyone (even the meat eaters) fantastically full, is now available through all the regular channels, like Amazon, Barnes and Noble, and of course, my favorite, HERBIVORE! A little bit about this book...besides the fact that Celine has totally outdone herself with some of the most amazing photos you'll ever see...it's totally full of comfort foods. Lots of deep fried deliciousness, lots of heavy sauces, lots of foods you might find yourself noshing on at a state fair. 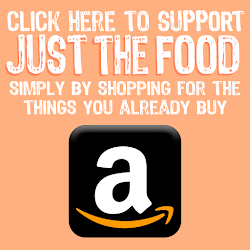 We've never claimed that this was a health food book, only that it is full of cruelty free recipes that are sure to please even the pickiest of carnivores. This is the book you can turn to when you are cooking for your in-laws for the first time to prove that you aren't starving your spouse by feeding them only twigs and berries. This is the book you can turn to when you are craving that doughnut, and aren't anywhere near Voodoo! This is the book you can turn to when you want a vegan version some crazy fast food concoction (read: the KFC Double Down). You know, the stuff you know you shouldn't, couldn't, or wouldn't eat everyday, but know that it's important to indulge every now and again. 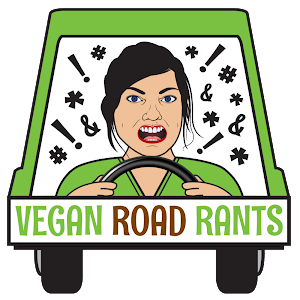 KATHARINA H. and CELYN: Please send me an email to joni@justthefood.com with your snail mail address so I can send you your books! As far as actual Cap'n Crunch goes, you do not need the real thing...although it does appear to be vegan, it does contain an insane amount of weird things in the ingredients, so try using a natural variety such as GORILLA MUNCH, if for no other reason then it has such a cool name! Mix together crushed cereal, flour, baking soda, and baking powder in a shallow dish. Mix in milk to make a thick batter. Preheat a frying pan on high heat. 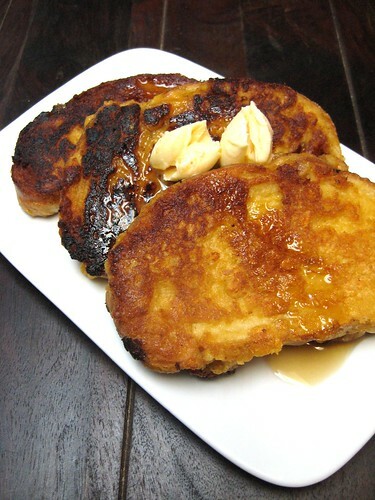 Melt some butter in the pan, use about 1 tablespoon (14 g) for every 2 slices of french toast. Coat each piece of bread with the batter. Since the batter is thick, you may need to help to smear it on the bread with your fingers. Pan fry for about 2 minutes per side, or until golden and crispy.